A wood-ball track and adventure climbing course has been installed by Austrian attractions provider, Sunkid. The mountain station of the Isskogelbahn cable car in Gerlos, Austria now boasts two 150m long wood-ball tracks. 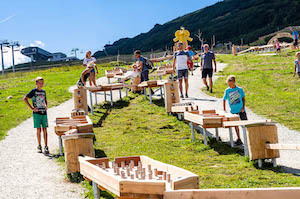 The installation allows visitors to race small wooden balls down a course that features different obstacles along its course, producing melodies on bells and xylophones built into it. According to reports, the addition of the attraction has increased turnover at the nearby F&B outlets alongside income from the vending machine which dispenses branded wooden balls at €2 each.